Another winner, wow this wine really delivers the goods and hits every note of tastiness that it possibly could except there's no long, caressing finish. But who cares, this an amazing "unfiltered" [screen decanting recommended] foodie type of wine that will easily merry with many types of Italian fare and give you that "Under the Tuscan Sun" feeling with each and every mouth-watering sip. In doing just a bit of research about the wine and the winery, they've a David vs. Goliath vibe going on, which draws you into rooting for the "underdog" something we as American's are very fond of doing. This is made easier by the fact that the price of admission gives a lot of bang for the buck. 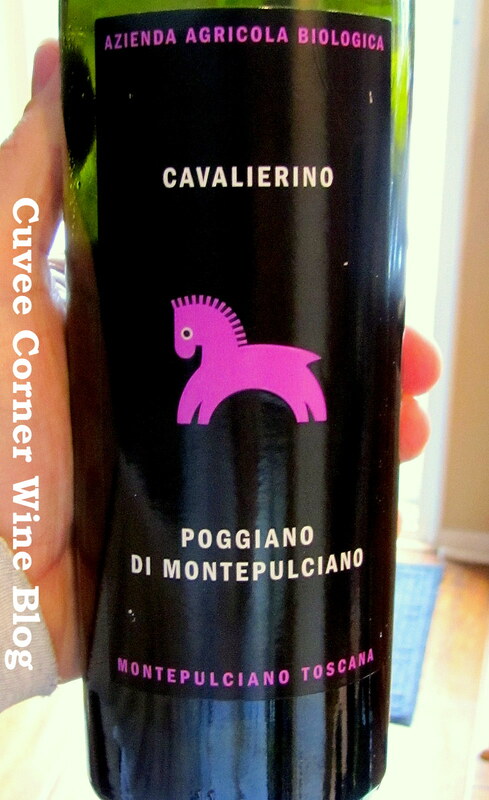 The Winery: Great new discovery of a Tuscan winery called Cavalierino or little horse [reflected on the label], which is a small [relatively new] winery in the rolling hills of Poggiano [fantastic views]. It can be found just within a stone’s throw from the historical towns of Montepulciano [not to be confused with the grape of the same name] and Pienza just south of Siena, in Italy's brilliant Tuscany region. Cavalierino sits high on a hill with just over 154 prime acres of vineyards, brimming with olive groves and a impressive array of cypress trees lining the drive up to the winery. According to their creative-director Lorenzo Ottaviani.“It is very difficult for a new small winery to emerge in the prime wine producing region of Tuscany" [but not impossible] and continued his thought by saying, "my strategic approach embraced such a handicap with enthusiasm". Swirl, Sniff and Slurp: A blend of 75% Sangiovese, 25% Cabernet Sauvignon in the glass finds a nicely colored garnet core. After stuffing my nose into the glass, fresh inviting aromas of dark cherry and blackberry and some finely ground herbal notes. In the glass this wine displays juicy mouth-watering acidity which keep the abundant red and dark fruit flavors in check and the nearly ripe but easy-going tannins meld ever so nicely into the medium length finish. Again a real food pairing wine, that will make you look like a wine and food pairing phenom. Full Disclosure: This wine was provided as media sample to Wine Harlots who graciously shared the bottle with my wife and I over dinner, to the delight of us both, after another bottle opened before hand had a lackluster moment on stage. What's the Score: On the score-front my initial impression was 87 points. But after a few more sips and thinking about this wines wonderful qualities and writing down my thoughts, I pushed the score up to a solid 90 points. With that said, I give this wine a hearty "buy" recommendation. This wine sells for about $22 USD and $17 Euros abroad. I'm not sure where it can be purchased, as I could not find a place that offers this wine here or imports this wine into the US market at the moment. However, if you live in the EU, I'm sure this bottle would be easily obtainable and I would recommend seeking it out. But remember, like I mentioned earlier, this wine would be best decanted. As I found it's throwing quite a bit of "unfiltered" sediment once you get near the end of the bottle. That's it for today, I hope you enjoyed this jaunt over to Tuscany and will join me next time for a trip down tasty-lane. Until next time sip long and prosper, cheers! jus loving it.. thnxx mate !! #IMO > If you operate an online wine store front, it's probably NOT a good idea to submit "spam" as a comment. The [failed] attempt to make an organic comment on this post, is evidence of a business person I would recommend to my readers avoid at all cost.